There were several prosperous centres in the Slovak territory during the period of the Great Moravia – home of the early Slavs. 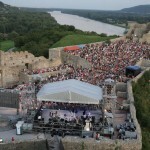 The most famous examples were the hill forts in Devín, in Bratislava and in Nitra. It was on one of Nitra’s hills where Prince Pribina ordered the building of a Christian temple dedicated to St. Emeram. Nevertheless, similar to Roman monuments, the early Slavic architectural works were destroyed almost without exception and today we can only assume their exact position and shape. But due to archaeological finds and historical documents we know that in those times the Slavs were building large hill forts with both profane/sacred and wooden/stone structures. One of the most remarkable structures was definitely the Christian church on the southeast terrace of Devin Castle Rock that formed an integral part of the then prince’s residence. The longitudinal building with triple-apsidal termination of its shrine and polychromatic plaster is proof,s of not only the exceptionally developed architectural art on the Devín hill fort, but also of the new direct influence in Great Moravia – the Byzantine Rite. The Great Moravian church within Devín castle was definitely a masterpiece of architecture in our region in this period, but the smallish Church of St. Margaret of Antioch also deserves our attention. It was built around the 9th century in the vicinity of the significant Great Moravian hill fort in Mikulčice. 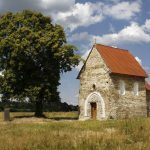 It’s unique, not just in Slovakia, as it’s the only preserved Great Moravian church and probably the oldest preserved Pre-Romanesque church. The impressiveness of the simple open-plan structure is even more emphasized by its location on the flatland of Moravian floodplains.